Product Description: The Amprobe LM-100 light meter measures the visible light from fluorescent, metal halide, high-pressure sodium or incandescent sources. It is a portable, easy-to-use digital light meter designed for simple one-hand operation reading in Lumen (lux) or footcandle (fc) units. 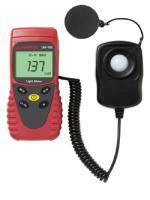 The LM-100 measures a wide range of light up to 20,000 fc or lux with an accurate, high resolution of 0.01 fc/lux. Use the LM-100 light meter to measure the illumination level in the interior and to switch off or reduce or increase the output level of lighting fixtures. Reduce the energy burden of the building by significantly increasing the efficiency of its lighting system. One lux is the illumination from a one candela lamp perpendicular to a surface one meter squared at a distance of one meter. One fc is the illumination from a one candela lamp perpendicular to a surface one foot squared at a distance of one foot. 1 footcandle = 10.764 lux and 1 lux = 0.09290 footcandles.